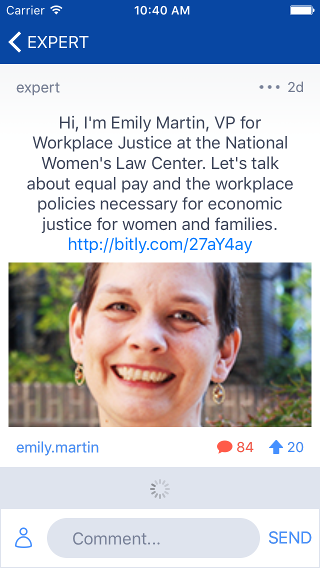 Emily Martin, General Counsel and VP for Workplace Justice at the National Women's Law Center, joined us on Tuesday, May 24 to discuss closing the wage gap, NWLC's Roadmap to Economic Justice, and confronting gender discrimination on Capitol Hill. @fogg.mcmahon: Hi emily! Did you hear the recent freakonomics on this topic? Curious if you have thoughts. The gist: discrimination can’t explain why women earn so much less than men. If only it were that easy. It is definitely true that the wage gap has multiple causes, as Freakonomics emphasized, and this requires multiple solutions. First, it is pretty clear that part of the wage gap is driven by pay discrimination based on (possibly subconscious) stereotypes. For example, in a pretty sobering and compelling 2012 study, science professors who were given otherwise identical applications for a lab manager position proposed an avg starting salary of $30,200 when the applicant was named John, compared to $26,500 when the applicant was named Jennifer. This happened for both male and female science professors reviewing resumes. Analyses have shown that the more women that enter an occupation, the more wages go down -- work tends to be devalued because women do it. I call that discrimination too. Discrimination in the form of harassment can also be part of what leads women not to pursue high wage work, like engineering, etc. 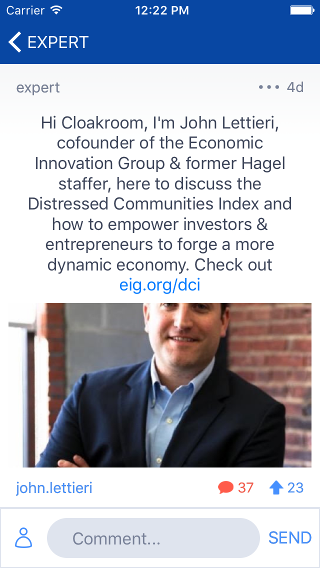 John Lettieri, co-founder and senior director for policy and strategy at the Economic Innovation Group, joined us on Thursday, May 19 to share the Distressed Communities Index and the introduction of the Investing in Opportunity Act. @hiscock826: Hi John. What do you think the single most important thing that's missing right now from our policy debate regarding spearheading a more dynamic economy like you said? 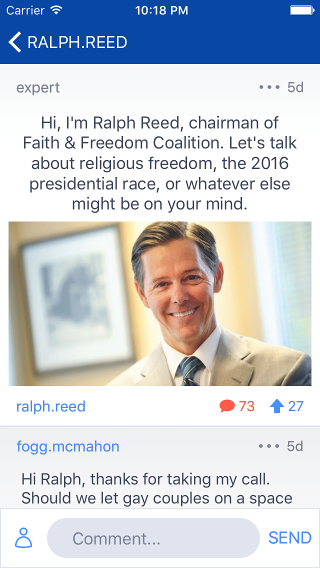 And how can we help? We need an obsessive focus on startups. There has been a 30+ yr decline in the rate of new business formation in the US -- counter to the perception that startups are at an all-time high. Most new businesses fail, but the ones that succeed are disproportionately responsible for job growth, and the healthy disruption you need in stale industries. Right now we have no startup strategy in terms of public policy. @morrow.fish: Your DCI analytical tools are impressive. 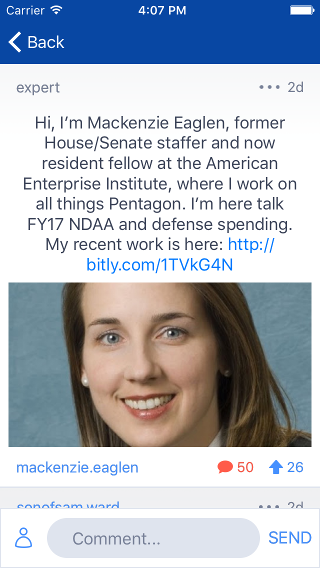 I'm also digging the way you're using big data to inspire legislation. Is this EIG's MO? Heck yeah! We definitely prioritize a data-driven approach as an organization. 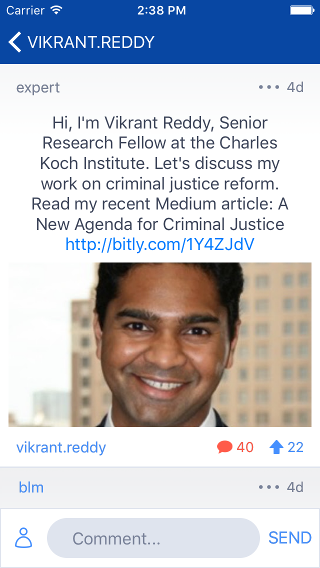 Our goal is to put better tools into the hands of policymakers, researchers, and the media to help tackle some really complicated issues. That's our bread and butter. 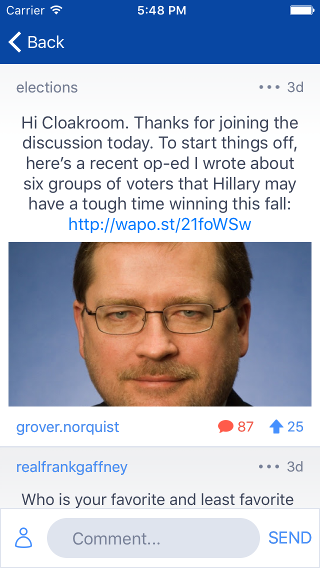 Grover Norquist is the president of Americans for Tax Reform and the champion of the Taxpayer Protection Pledge. Mr. Norquist joined us Friday, April 29th, 2016 to discuss tax reform, Burning Man, and Hillary's challenges in 2016. @conspickle: Regardless of who the GOP nominee is, what will be Hillary's biggest challenge in the general? Hillary's challenge in the general election is her age -- her ideas & understanding of the electorate are old. Visit www.hightaxhillary.com to see Hillary's threats of taxes on new constituencies. Hillary supported gun control in 1993. Though all gun owners lived in Wyoming. She supported a 25% tax on guns & a $2500 fee to sell a gun. Today, there are more than 13M Americans with Concealed Carry permits. 1M in PA. 1.5M in FL. 450k in OH. 650k in MI. Swing states. Hillary is old enough to think insulting oil and gas workers costs votes only in TX, LA, OK, AK. How fracking has brought energy jobs to OH, PA, and CO -- try and get 270 electoral votes without those states. 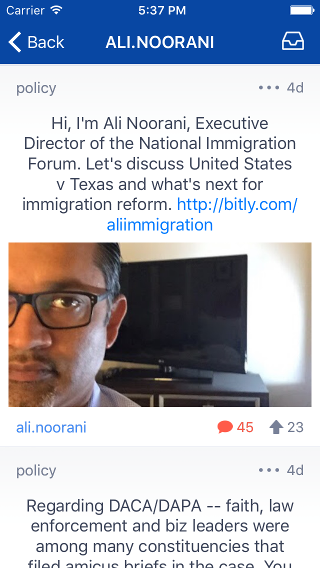 Ali Noorani, Executive Director of the National Immigration Forum, is a leading voice on immigration policy and politics. He joined us on Thursday, April 28th, 2016 to discuss immigration reform and the United States v. Texas SCOTUS case. 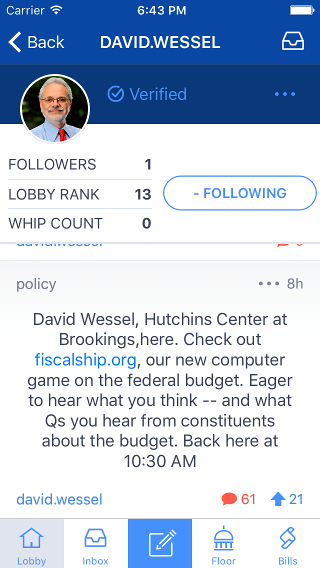 David Wessel is a Pulitzer Prize-winning journalist and the director of the Hutchins Center on Fiscal and Monetary Policy at the Brookings Institution. Mr. Wessel joined us on Tuesday, April 27th to discuss the Fiscal Ship — www.fiscalship.org — a new web game that challenges you to put the federal budget on a sustainable course. 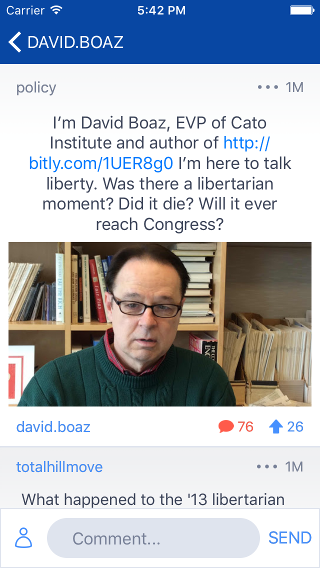 David Boaz, author of the Libertarian Mind and Executive Vice President of the Cato Institute, joined us on Cloakroom for an Expert Q&A on to talk about the role of Libertarianism is Congress today. @doug.stamperer: Hi David, thanks for doing this. Let's assume Clinton and Trump are our nominees. 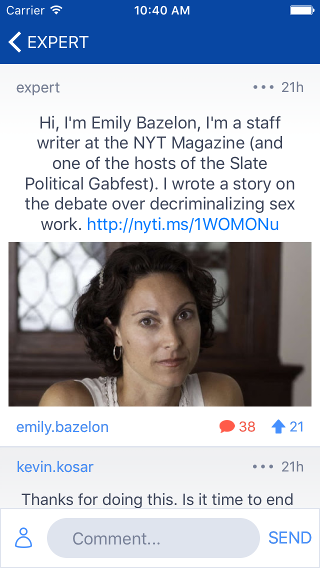 Whose worse for Liberty and what do you do to stop them? (And what policies make them worse). That’s a really bad choice. But probably Hillary is a firmly statist politician, while Trump actually has no respect for constitutional and political norms. I fear him more as a threat to the republic than for his barely discernible policies. Do about it? Try to stop him (and her) in the primaries.